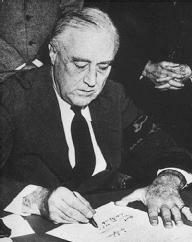 On December 8, 1941, President Franklin Delano Roosevelt signs the Congressional Declaration of War on Japan. The first Pleading in a lawsuit governed by the rule of Common-Law Pleading. In the law of evidence, a statement or narration made not under oath but simply in the middle of things, as a part of what is happening. Also, a proclamation. A declaration is the plaintiff's statement of a claim against the defendant, formally and specifically setting out the facts and circumstances that make up the case. It generally is broken into several sections, which describe the different counts of the Cause of Action. The declaration should give the title of the action, the court and place of trial, the basis for the claim, and the relief demanded. The defendant then answers with a plea. Common-law pleading has been abolished in the United States, and modern systems of Code Pleading and rules based on federal Civil Procedure now provide for a complaint to accomplish the same purpose as did the declaration in former times. Under some circumstances, statements made out of court by one person may be repeated in court by someone else even though the Hearsay rule ordinarily forbids secondhand testimony. For example, a Dying Declaration is a statement in which a Homicide victim names his or her killer on his or her deathbed. If the victim had known who had attacked him or her, had abandoned all hope of recovery, and had in fact died of the wounds, a person who heard the dying declaration can repeat it in court at the time the killer is brought to trial. The theory is that a deceased person would not have lied just before dying. A declaration against interest is another type of statement received into evidence even though it is being repeated by someone who heard it out of court. It is any comment that admits something harmful to the rights of the person who made the statement. For example, a driver says to his or her passenger just before the car misses a curve and ends up in a ditch, "I know the brakes are bad, but don't worry." Later when suing to recover compensation for injuries, the passenger can testify that he or she heard the driver make a declaration against his or her interest even though that testimony is hearsay. Customs law requires all persons entering the United States to provide officers with a list of merchandise they are bringing into the country. This list is also called a declaration. Real property laws in various states require the filing of statements to disclose plans that establish certain rights in particular buildings or parcels. For example, a homeowners' association formed by neighbors to maintain a recreation center owned by all of them together may file a declaration of covenants. A builder may be required to file a declaration of condominium before beginning to sell new units. As a preliminary step before becoming naturalized U.S. citizens, Aliens must file a declaration of intention which states that they are honestly trying to become citizens and that they formally renounce all allegiance to any other nation where they were ever citizens or subjects. The Declaration of Independence was a formal announcement on July 4, 1776, by which the Continental Congress of the United States of America proclaimed the independence of the people of the colonies from the rule of Great Britain. It explained the reasons for their assertion of political autonomy and announced to the world that the United States was a free and independent nation. International Law recognized that nations may formally and publicly proclaim a condition of armed conflict by a declaration of war, which in effect forbids all persons to aid or assist the enemy. In the United States, the Congress has the authority to declare war, and a declaration fixes a beginning date for the war. A declaration of a dividend is an act of a corporation in setting aside a portion of net or surplus income for proportional distribution as a dividend to those who hold shares of stock. DECLARATION, pleading. A declaration is a specification, in a methodical and logical form, of the circumstances which constitute the plaintiff's cause of action. 1 Chit. Pl. 248; Co. Litt. 17, a, 303, a; Bac. Abr. Pleas, B; Com. Dig. Pleader, C 7; Lawes on Pl. 35; Steph Pl. 36; 6 Serg. & Rawle, 28. In real actions, it is most properly called the count; in a personal one, the declaration. Steph. Pl. 36 Doct. Pl. 83; Lawes, Plead. 33; see P. N. B. 16, a, 60, d. The latter, however, is now the general term; being that commonly used when referring to real and personal actions without distinction. 3 Bouv. Inst. n. 2815. 2. The declaration in an action at law answers to the bill in chancery, the libel of the civilians, and the allegation of the ecclesiastical courts. 3. It may be considered with reference, 1st. To those general requisites or qualities which govern the whole declaration; and 2d. To its form, particular parts, and requisites. 4.-1. The general requisites or qualities of a declaration are first, that it correspond with the process. But, according to the present practice of the courts, oyer of the writ cannot be craved; and a variance between the writ and declaration cannot be pleaded in abatement. 1 Saund. 318; a. 5. Secondly. The second general requisite of a declaration is, that it contain a statement of all the facts necessary in point of law, to sustain the action, and no more. Co. Litt. 303, a; Plowd. 84, 122. See 2 Mass. 863; Cowp. 682; 6 East, R. 422 5 T. R. 623; Vin. Ab. Declarations. 6. Thirdly. These circumstances must be stated with certainty and truth. The certainty necessary in a declaration is, to a certain intent in general, which should pervade the whole declaration, and is particularly required in setting forth, 1st. The parties; it must be stated with certainty who are the parties to the suit, and therefore a declaration by or against "C D and Company," not being a corporation, is insufficient. See Com. Dig. Pleader, C I 8 1 Camp. R. 446 I T. R. 508; 3 Caines, R. 170. 2d. The time; in personal actions the declaration must, in general, state a time when every material or traversable fact happened; and when a venue is necessary, time must also, be mentioned. 5 T. R. 620; Com. Dig. Plead. C 19; Plowd. 24; 14 East, R. 390.; The precise time, however, is not material; 2 Dall. 346; 3 Johns. R. 43; 13 Johns. R. 253; unless it constitutes a material part of the contract declared upon, or where the date, &c., of a written contract or record, is averred; 4 T. R. 590 10 Mod. 313 2 Camp. R. 307, 8, n.; or, in ejectment, in which the demise must be stated to have been made after the title of the lessor of the plaintiff, and his right of entry, accrued. 2 East, R. 257; 1 Johns. Cas. 283. 3d. The Place. See Venue. 4th. Other circumstances necessary to maintain the action. 7.-2. The parts and particular requisites of a declaration are, first, the title of the court and term. See 1 Chit. Pl. 261, et seq. 8. Secondly. The venue. Immediately after the title of the declaration follows the statement in the margin of the venue, or county in which the facts are alleged to have occurred, and in which the cause is tried. See Venue. 9. Thirdly. The commencement. What is termed the commencement of the declaration follows the venue in the margin, and precedes the more circumstantial statement of the cause of action. It contains a statement, 1st. Of the names of the parties to the suit, and if they sue or be sued in another right, or in a political capacity, (as executors, assignees, qui lam, &c.) of the character or right in respect of which they are parties to the suit. 2d. Of the mode in which the defendant has been brought into court; and, 3d. A brief recital of the form of action to be proceeded in. 1 Saund. 318, Id. 111, 112; 6 T. R. 130. 10. Fourthly. The statement of the cause (if action, in which all the requisites of certainty before mentioned must be observed, necessarily varies, according to the circumstances of each particular case, and the form of action, whether in assumpsit, debt, covenant, detinue, case, trover, replevin or trespass. 11. Fifthly. The several counts. A declaration may consist of as many counts as the case requires, and the jury may assess entire or distinct damages on. all the counts; 3 Wils. R. 185; 2 Bay, R. 206; and it is usual, particularly in actions of assumpsit, debt on simple contract, and actions on the case, to set forth the plaintiff's cause of action in various shapes in different counts, so that if the plaintiff fail in proof of one count, he may succeed in another. 3 Bl. Com. 295. 12. Sixthly. The conclusion. In personal and mixed actions the declaration should conclude to the damage of the plaintiff; Com. Dig. Pleader, C 84; 10 Co. 116, b. 117, a.; unless in scire facias and in penal actions at the suit of a common informer. 13. Seventhly. The profert and pledges. In an action at the suit of an executor or administrator, immediately after the conclusion to the damages, &c., and before the pledges, a profert of the letters testamentary or letters of administration should be made. Bac. Abr. Executor, C; Dougl. 6, in notes. At the end of the declaration, it is usual to add the plaintiff is common pledges to prosecute, John Doe and Richard Roe. 14. A declaration may be general or special; for example, in debt or bond, a declaration counting on the penal part only, is general; when it sets out both the penalty and the condition, and assigns the breach, it is special. Gould on Pl. c. 4, Sec. 50. See, generally, Bouv. Inst. Index, h.t. 1 Chit. Pl. 248 to 402; Lawes, Pl. Index) h.t. ; Arch. Civ. Pl. index, h.t. ; Steph. Pl. h.t. ; Grab. Pr. h.t. ; Com. Dig. Pleader, h.t. ; Dane's Ab. h.t. ; United States Dig. Pleadings ii. There were some 19 declarations which a candidate for the National Assembly or provincial assemblies or the Senate was required to make in the nomination form. While this seeks to mitigate revenue leakages, the system will also give an opportunity to importers to validate their declarations done by clearing agents before they are submitted to customs. 87-17 of 10 April 1987, concerning the declaration on the honour of the property of members of the Government and certain categories of public officials which stipulates that any person who does not provide the declaration of assets in time will be removed from office. 6 MD, durant les neuf premiers mois 2016, notamment suite a la declaration de l'extension d'une unite de confection pour un montant de 15. The four senators - Recto, Sotto, Escudero, and Ejercito - were among the 17 senators who voted in favor of a resolution supporting the martial law declaration. While announcing the details of IDS on Saturday, Finance Minister Arun Jaitley too had stressed that no break- up of the declarations on the basis of trades/ cities/ states would be released in order to ensure absolute secrecy with respect to the identity of the declarants. The Fuji Declaration has already received support from such people as Astronaut Edgar Mitchell, Dr. The declaration had been signed by 2,212 academics in Turkey and 2,220 from abroad by the time it was closed on Thursday. Baroud spoke on Saturday, from Phoenicia, in a seminar titled "From the Charter to the Declaration of Bbda: neutrality and dialogue for stability and prosperity," under the patronage of head of State, Michel Sleiman. The Bbda Declaration constitutes an important document closely linked to the National Dialogue Committee's work. The constitutional declaration passed last week contains many concerning elements, according to Egyptian civil society organisations. We all know July 4 is the date printed on the Declaration of Independence, but the Continental Congress actually declared independence on July 2.